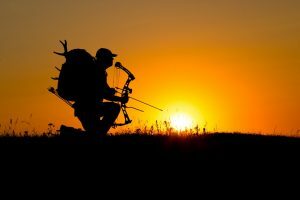 What is hunting all about? By definition, hunting refers to the act of pursuing wild animals for recreation or food, whereas the animals being hunted are referred to as game. The only difference between primordial hunting and modern hunting is that there are laws and regulations governing the latter. Whereas hunting is controlled and restricted where a given species is in danger of extinction, poaching is in all ways illegal. Think of it as illegal hunting, or hunting without the legal permit to do so. It mostly involves killing wild animals for their valued body parts such as skin, fur, and tusks—not for food—and with a sole aim of profiting from them. Poaching can also be viewed as theft for game. Or quite simply encroaching upon or trespassing a restricted area to steal game or fish. It’s done off season. When there are legal restrictions barring the hunting of certain species of animals at a given time. It’s done without a permit. It’s conducted using an illegal weapon, such as stun guns and spotlights. Or when conducted from a moving vehicle. It’s conducted using illegal baits that are detrimental to the animal’s health or bring it more suffering and pain. The hunted animal has been tagged by researchers to be in danger of extinction. It’s conducted on private property and without the owner’s permission. According to the stats collected by the NSSF (National Shooting Sports Foundation), hunting is the third safest sport. It’s in fact safer than golf, tackle football and volleyball. Hunting is a great exercise for both the mind and the body. Besides the kill, being afield gets you reacquainted with the outdoor environment. To some people, hunting is a hobby. The only activity that grants them the opportunity to get off the grid and step outside to refresh. Hunting sportsmen contribute a cool $75 million per day towards habitat conservation and improvement through licences fees and the excise taxes on firearms and ammo. Game population must be controlled at all times. Otherwise there would be no enough land to support agriculture or enough habitat to support the natural range of wild animals. If some animals are NOT hunted, believe it or NOT most of them would still die of starvation. And as land use continue to increase, the need to manage game continues to become even more intense. Hunting gear and gadgets can be costly, but hunting per see can be conducted on a measly budget. Whether it’s for recreational purposes or food, hunting once in a week can provide you with enough supply of wild meat to take your family through an entire week. In US alone, hunting is responsible for about 600, 000 jobs, generating about $66 billion revenue for the government. Looking for some ways to spend quality time with your family and children? Well, hunting offers a great opportunity to get them off the computer or TV and teach them resourceful, self-sufficient life lessons they’ll NEVER forget. 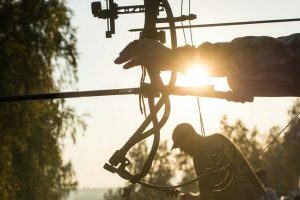 Most of the hunting tips you’re likely to find anywhere mostly focus on advanced techniques’ that lend a blind eye on the basics. All you have to do is run an online search for a local safety course for hunters and select one. Most states require that you obtain a hunting license before embarking on any act of hunting. It’s always good to ensure you have one even when it’s NOT mandated in your state. Simple logic demands that you wear layers when it’s warm and coveralls and heavy coats when it’s cold. 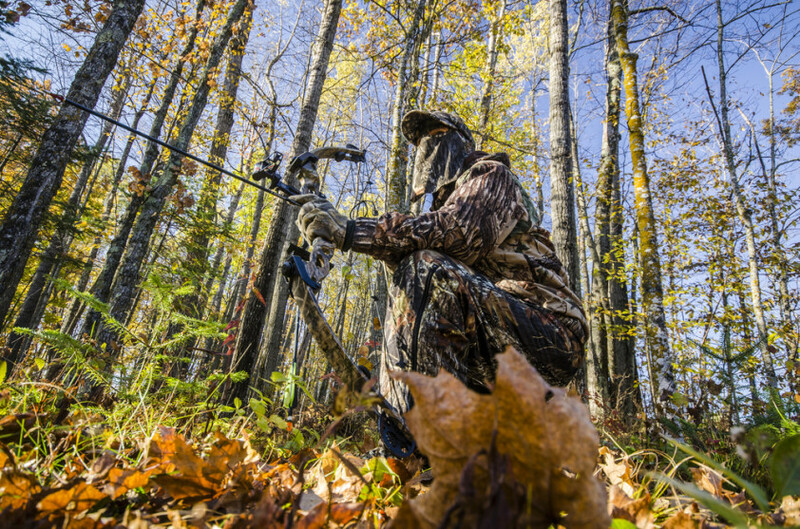 And if you’re out for bow hunting, makes sure the layers and coats are well-camouflaged. For gun hunting, you have to ensure you have enough orange. Vests are great because they can be worn over t-shirts and parkas. The boots you buy should be quality and waterproof. If the weather is cold, then it’s important to ensure they at least have 800 grams of thinsulate to avoid ruining your hunt with cold feet. If your feet are warm, comfortable, and light, you can be rest assure you’ll have a smooth hunting. Hiring or buying a gun gives you an opportunity to test out your personal preference before spending on any ammo. You don’t want to waste your money on a gun you’ll be tempted to throw away after some time of using it. However, each time you borrow or hire someone’s gun, make sure you treat it like a valued possession and return it when it’s cleaner than it were when you took it. You have to get comfortable with your firearm, crossbow, spear or whatever shooting tool you’ll be using before you go out to try them in the field. Try taking different shooting ranges at tin cans placed on fence posts or 3D targets. Whatever you do, don’t let your first shot happen in the field. Make some hunter friends and try asking them about the specific features, landscape and animal habits at your local hunting field. Ask them as many questions as you can to understand local hunting and get a head start. A beginner hunting gear shouldn’t be complicated. In your hunting backpack, make sure you have a sharp knife, gun, enough bows and good boots. The trick is to start slow then upgrade later on as you learn the ropes. Online video sites such as YouTube have so many hunting videos that you could watch and improve on your hunting skill. Make good use of any hunting material you happen to come by and make it your mission to improve on your skill at every chance you get. Hundreds of hunters lose their way in the woods every year. It’s possible to get lost too if this is your first time to go hunting. To stay safe, always ensure there’s someone who’ll come looking for you or report to the local authority should you fail to return home at the end of the day. 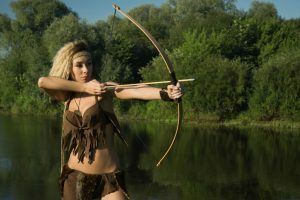 Bow hunting has been part of our ancestors lives. It’s deeply embedded in our nervous system and brain. All our ancestors needed to bring down a large mammoth was a simple bow and some arrows. That was long before gun powder could even make sense. Now the technique has significantly evolved. We have crossbows that are even more efficient and deadly, and which challenges you to become a better hunter and stretch beyond your limits. Good hunter use both firearms and bows to keep everyone safe and to ensure that they never run out of ammunition. But if asked to choose between the two, why would anyone recommend bow over firearms? Well, for starters, bows make the minimal amount of noise. Your target won’t even notice they are in danger until they are caught off-guard. Firearms on the other hand make an ear smashing noise immediately the bullet exits the barrel. Bows are lighter and therefore easier to carry around. Riffles are the exact opposite as they are made from compound materials and other gadgets that make them somewhat heavy. Arrow can be recovered and re-used, meaning you’re less likely to run out of arrows during the hunt. Ammunition on the other hand can only be acquired by purchasing. This puts you at risk of running out of ammunition while the hunt is still in progress. Arrows are much fun. You can feel the hunting excitement as you sneak up upon the prey to take a closer shot. Guns are much easier. You can take the shot from any angle and distance, thus losing some of thrill that comes with being a deft hunter. Arrow can only travel at great distance if shot by someone strong. Bullets only need a good aim—no effort. 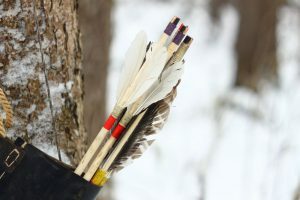 Bows demand that you train under various weather conditions to understand the right lengths to make under different weather conditions to take the best shot. 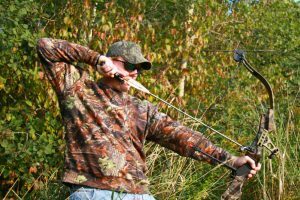 Ask any experienced bow hunter for some tips and the first thing they’ll tell you is that accuracy matters the most when it comes to bow hunting. If your accuracy makes the cut, you can use the simplest bow you’re likely to find in the market to bring down the biggest game. However, there are tricks that you can put into practice to put down any kind of game when you feel like your aim isn’t that commendable. For instance, you could avoid taking a stiff and light bow, in lieu of a longer and heavier one. This bow might be slower, but it’s easier to hold it accurately as your arm won’t be shaking at full draw. If your accuracy isn’t cut out for the task, then make accuracy your first priority and speed second. Find a way to sneak closer to your prey before taking the shot. Focus on NOT missing and forget about speed. More importantly, remember the first hunting rule—only take the aim if you’re certain the kill will be clean. Torturing or butchering an animal to death is not only inhumane, but unacceptable as well. Practicing when the light is less will help you master your maximum effective range. Besides, that’s the time when most tail shots do happen. You may find yourself using this knowledge more often in the hunting ground. Start by standing straight, your feet shoulder-width apart and your eyes glued directly at your target. Make sure there’s a straight line and NO obstacle between you and the animal you’re aiming at. You could also try playing with your toe position to attain more stability. An anchor point refers to the position your release hand assumes at full draw. Experienced hunters measure it using the distance between the hand and their face. The best way to find the point is to try experiencing with multiple position. And when you finally locate the point, try practicing it multiple times to master it fully. Avoid squeezing the bow’s handle using the other handle. Instead, try pressing the handle against your hand heel, flanked by the fleshly pads. 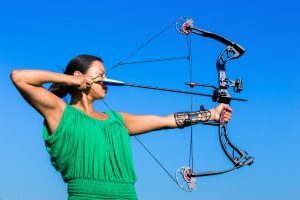 You hand must be both open and relaxed as you release the arrow to create more force. After getting at full draw, try checking your position—the release arm pulling the string must be aligned with the part you want to hit—before making the release. It’s also important to ensure the shot is NOT headed down. This could be the case if the bow happens to be too stiff. After double-checking the position, go ahead and release the arrow. Avoiding rushing or flaking if you happen to be a beginner as your arm may start shaking and instead end up affecting the shot. Whether you’re hunting a deer, duck, elk, or lion, blood trail is all you need to get all the information you need to know about the direction the wounded animal is heading, where the shot landed or how quickly should you follow up the trail to find the animal. If the blood is bright red, odds are the shot landed right on the animal’s lungs and it’s just a matter of time before the animal falls down. Meaning the animal is just a couple of meters from where you are. Purple or dark blood hint a gut shot. In case you find such blood, give the animal enough time to stiffen up and bed down before you can hit them again with follow up shot. Chasing a gut-shot animal immediately you make a shot will only make it run long distances. The best trick is to give it enough time to think it’s out of danger then use the trail to sneak up on it and take a follow up shot. How to successfully use a hunting blind. a) Pop-up blinds. These are lightweight blinds designed to ‘pop’ open when needs be and can also be folded back into position for storage. b) Portable blinds. These have been made in such a way that they open from the top for easier hunting access. They can also be relocated when the target animal also moves, so that you as the hunter aren’t left stranded in one place as the animal shifts position. Apart from these there are also specific prey blind models for duck, goose and deer. The key to using these products successfully is first identifying a proper location. For instance, placing a contraption out in an empty field would definitely not go well since the animal would definitely see it. Find somewhere that’s more concealed where the prey is less likely to detect your presence. Similarly, consider the animal’s natural behavioral tendencies before putting up the blind. Find places where the target often wanders in search of food or water, such as trees/shrubs that grow fruit, the peripheries of agricultural plantations such as soybean or corn fields as well as local watering spots like ponds, lake shorelines or streams. It’s also helpful to check out for bedding or travel routes. Ask local residents where they often see deer or turkey roaming around on regular basis. Similarly, you can find these travel routes by yourself through checking out the right places like creek bottoms, the edges of forested lands and so forth. When ready to set up your hunting blind, clear the chosen spot of anything that might suddenly snap or move. Remove weak branches and piles of brush or leaves that may be on the surface. Then carefully install the unit so that it’s at optimal range for using your choice hunting weapon with efficiency. For rifle guns, you’ll need at least 300 yards range, and around 30 yards for bow hunting. Similarly, when inside the blind remember to stay quiet always. Just because you’re inside this unit does not mean that animals cannot hear what’s going on around them. In conclusion, think about factors like wind direction since your scent can easily be carried by the breeze if it’s passing through where the prey is situated. Position yourself away from where the wind is going. Avoid opening the window openings fully and stay away from them as much as possible. In addition, note that your body can form a shadow if the sun is up so try and be as still as possible so that the animal can confuse it with a harmless non-moving entity such as a tree. 5 Tips on How to Hunt Turkeys. Over the years, turkey hunting has become a favorite sport and recreation activity for many people especially during the spring. Turkey hunting can be a fun and exciting activity if you know a few important tricks of hunting. Stay tuned as I will be giving you tips on hunting wild turkeys plus other interesting things you didn’t know about turkeys. You will need an exciting destination for turkey hunting when the next spring season comes knocking. Texas boasts as one of the leading hunting destinations for Turkeys in the US. If you are a turkey enthusiast, this is one of the places you do want to be left out. The first step to a successful turkey hunt begins with scouting. You can survey for the turkeys to check out their location. Most Turkeys stroll in groups thus you can easily identify and locate them. When the Turkeys are not noticeable from their hideouts, turkey guides can be of help. You can ask them to point you in the right direction. Once you know there location, you can now strategize on how to catch them. Turkeys can be easily tricked. Start by moving closer to the Turkeys until you reach a hearing range. Call out the Turkeys by making soft noise then gradually increase your tone. Wait patiently as you call them out until you have their attention. You can wait for as long as 30 minutes before you can set an ambush. Sometimes Turkeys can be apprehensive to strange behavior. If you call out for turkeys and don’t get a response within 30 minutes, you know the turkeys have noticed you. You can anticipate a no response by approaching them from the front at a safe distance and ambush them as soon as the time expires. Observing the Turkeys` behavior is crucial in catching them. Most Turkeys leave their woods by mid-morning. Setting up during this time can increase your chances of catching them. However, this method may not work throughout the season as turkeys often change their behavior pattern towards the end of the season. You can try the mid-morning technique especially during late seasons. Tip#5. Choose an excellent Hunting park. When it comes to hunting turkeys, Turkeys are best caught in parks with excellent roosting and hunting parks. Certainly, you will enjoy a turkey hunt where you have adequate running spaces, turkey guides and plentiful nesting sites. These features can increase the chances of a successful hunt. Turkey hunting in Texas is characterized with fun and enthusiasm yet with challenges that are worthwhile. If you are looking for a perfect holiday destination that will live in your memory, Texas is one of them. You should spice up your holiday with turkey hunting in Texas. The tips on turkey hunting discussed above can come in handy when you visit your desired turkey hunting destination in Texas. You are a discerning hunter and currently you are into moose hunting. Now, do you want to dramatically increase your chances of getting this animal this fall? Well, you are in the right place; below are simple and yet effective moose hunting tips that will take your game and hunting skills to another level. Just like any other animal, the key to a great moose hunting trip is knowing where the bull moose will be during a certain hunting seasons. Normally, a good number of hunters confine their trips to summer months only to be disappointed come fall when bull moose cannot be found. If you spot a bull in summer, hunt there on the opening day. Moose have great senses of hearing, smell and eyesight to help themselves from natural predators such wolves and us human. One of the best things you can do when hunting for moose is making sure you are not detected at all cost. Paying very close attention to wind directions is actually one of the biggest considerations. For example, when you are on a hunting mission, hunting with the wind in your face will be more productive that hunting with the wind at your back. As if that is not even enough; avoid sitting out in the open or on the skylines when glassing for moose. If you can sit near trees or stumps to break your outline, that would be counter productive. The key thing is not to be noticed at all. Hunting clothing will make a whole new difference; it is because of this hunters are advised to wear clothing that does not make any kind of noise while they are moving. Wool or fleece is the best. Moreover; you need to arm yourself with quality waterproof boots to keep your feet warm and protected while out there in the wild. Although, there are quite a number of rifles you could use, you should go armed with a large caliber rifle. Most professional hunters prefer .300 or 7 mm; you also should do the same. It does matter the kind of technique you choose to use, hunt early and late in the day for that is the time when most bull moose are active. Although, this is probably one of the most popular hunting techniques many moose hunters use, many get it all wrong. When you are in the mountains hunting for moose, choose a spot with excellent panoramic view of the hillside you are on. Be very observant and be on the look out for any kind of movement, white spots or dark shapes. You will be able to see just the head or part of the moose body. Moreover, if you can go hunting with a high quality pair of binoculars, that would even more productive. Silently floating down rivers is a very pleasant and effective way to hunt moose. The key here is to float quietly around a bend and see a moose eating willows, walking or drinking on a riverside trail. Hunting pheasants is a challenging task. This bird likes to hide in the smallest possible cover, run ahead of hunters through the thickest brambles and burst from cover rapidly flying to safety. However, there are some tips and strategies that experienced hunters claim to give promising results. A lone hunter might move with ease through some rough areas or small patches of land that a group might not want to examine for pheasants. However, areas mostly inhabited by pheasants may be difficult for one hunter to cover. If several hunters work together, it will not only result in finding more birds, but the outdoor experience that they share will be equally important. When you want to cover large areas or sweep through corn fields, the best way to do it is by placing blockers. Pheasants are notorious for their ability to run away ahead from hunters. Blockers are stationed hunters that should be placed at the end of the field. Once birds run ahead and try and break cover, blockers will get an open shot. When you have blockers present, it will force birds to hold tight, which will give more shooting opportunities for both walkers and blockers. With blocker technique, it is of utmost importance to know the exact position of your blockers. Make arrangements beforehand on who is going to do the shooting. Blockers usually control the end of the field, and walkers shoot the birds that they walk by or those that try to fly behind their lines. In the early season, pheasants tend to sit tighter. This allows both the hunter and dog to approach them closely while they are still resting. The reason for this is that the birds haven’t been pressured much at this point, which means that you will get closer shots. Some hunters prefer 20-gauge shotguns for hunting pheasants, while others like a 16-gauge. The always popular 12-gauge, which is also used for duck and goose hunting, will prove to be a good choice. A #6 shot will be an excellent choice for the early season. Your 20-gauge gun is also a nice choice for these early birds. As the season progresses, you will want to switch to a tighter choked 12-gauge gun, and you will need more power from your shells. The birds are on constant alert being scared off by so many hunters and predators. They are easily scared and try to fly off early, and a heavier powder loaded #4 or #5 shot will give the right amount of power to knock down the birds at longer ranges. You can go through a field alone, but a dog with a good nose will go in and find birds straight away. A good dog will prove to be handy for birds that like to hold tight to their resting spot in the heavy grass. Pheasants will not always burst when approached, and if you just walk past them, they will not move even an inch. A pointer dog will mark the exact location, and once you’ve knocked a bird down, the retrieving ability of a good dog is an invaluable asset. A dog can track down and find even wounded birds that might not fly but can still run fast, which results in fewer lost birds and birds that are left behind wounded. There are popular breeds of bird dogs like setters, but the breed of the dog is not that important as its ability to stay close and listen. A dog that runs too far ahead will flush birds that are out of shooting range. It is best to hunt pheasants early in the morning and again in the evening. You will flush more birds by walking slowly and quietly in a zigzag motion, working back and forth across the field. If you are looking for pheasants, look for water. The birds will gravitate to streams and water holes during hot weather. Practice before season. A shooting range to get familiar with your gun and visits to hunting clubs might do some good to both you and your dog. Always remember to wear hunter orange. Orange vests and caps, dog collars, and dog vests all help in making your hunt safe. Don’t forget to shoot only at high rising birds that are in a safe line of fire. Wild boars, also known as wild pigs or wild hogs, are a wild ancestor of the domestic pig and are known to attack rabbits and when provoked might attack dogs or cats. They are native much across Northern and Central Europe whereas populations have been introduced in the Americas and Australasia. In America, you’ll find most wild boars in the southern gulf states like Alabama, Louisiana, Texas, Florida and Mississippi. 1. Picking the right firearm and ammo – Even before heading out into the wild you need to consider the kind of firearm that will be effective for your hunt. Unlike deer, wild hogs tend to attack when shot at rather than run away. You therefore need to have a perfectly placed shot to the heart which is always not easy to get. Therefore, the best firearms that will effectively put down a wild boar are either multi-shot high powered rifles, revolvers and pistols. You can also use a shotgun that has choke as well and don’t forget to check the firearm restriction in your particular state. As for the ammo, you need to have high velocity hollow-point hard cast bullets that can easily fall a wild boar as well as long range bullets for shots made from a distance. 2. Calling out wild boars – Wild boars are territorial animals and they usually respond to calls better than other wild animals. A good strategy for taking out a hog hidden in the bedding nests or among thickets is giving it a call and being ready to take it out once it comes charging towards you. 3. Baiting – You can lure a wild hog quite easily using a bait. Baiting usually leads to increasing numbers of wild hogs spawning in a particular area and also attract more wild hogs that may be within the radius of the bait. This strategy is quite effective for a team of hunters looking to make a quick harvest of several wild hogs at the same time. 4. Stalking hogs – Wild hogs usually have a hypersensitive sense of smell but poor eyesight that is why stalking hogs after spotting them from a far is an effective method that will help you draw it out when you are ready for the kill. You will need to spend a fair amount of time behind your binoculars though but a good strategy would be to check for the hogs at the water sources earlier on during the day before they scatter and head into the bush. 5. Dog hunting – Dog hunting is quite popular and has a 96% success rate at hunting a wild boar than any other method. A properly trained hog dog will search out the scent of boars in the wild and help you cut down on the search time for these beasts. Dog hunting usually entails two sets of dogs which work as a team, the bay dog and the catch dog. The bay dog searches for the hog through scent and once it locates it, it lets out a howl for the hunter to release the catch dog. The catch dog is the burliest dog and it meets up with the bay dog and gets hold of the boar until the hunter gets there. Dove hunting is a sport practiced in Argentina. Sports men use guns for hunting doves. These are estimated to be between 20 to 50 million in Cordoba. Thus hunting them for sport is ideal since they in big numbers, sports men use this chance to indulge and test their hunting skills. When it comes to their concentration, Macha Hills stands out for having a sizable roost. It is located 60 kilometers north of Cordoba’s international airport. The Los Chancres lodge offers the most exclusive access to the Macha Hills as a sizable portion of it is located on its property, therefore in less than 15 minutes. The hunters will make their way to the best hunting ground in the whole of Argentina. Los Chancres therefore is the best choice for anyone who wishes to have a memorable dove hunting experience in Argentina. Los Chancres has a unique game management programme that has been running for the last 11 years. In this programme several hundreds of acres are planted with sunflower in summer months of the year and wheat in the winter months. In addition to planting crops, huge quantities of corn around 400 tons is put in the grounds for the birds to feed on. Water for birds is carefully monitored through out the property, this is done by digging water holes throughout the property at Los Chanares. In Argentina, dove hunters are treated to a variations in hunting experiences. For example high birds, beginner birds, fast birds, extremely dense flocks, all this is planned carefully to give hunters the best hunting experience thanks to the hunting programme that was introduced to enhance the entire hunting experience. A hunter can expect million of doves throughout the year within short driving distances from their beautiful hotel or lodge rooms thanks to the hunting programme. The hunting of doves in Argentina is coupled is fine hospitality. Guests can expect the presence of fine wines and spirits, great rooms with internet services, great chefs and round the clock room service. They also provide swimming pools to cool visitors in summer or any other part of the year. The special attention given to dove hunters will exceed the expectations of many as its tuned to the finest hospitality standards in the world. When planning to go dove hunting one needs to have a number of issues looked at to ease their journey. First its best to book about 6 to 9 months before traveling. Hunters should choose the place they want to hunt doves, this they can do through tour guides. Fortunately doves fly all year round. Depending from the place of the earth or continent one is coming from. Its important to carefully map out the travel plans with well informed travel agents in your country or you can contact Brigitte at brigitte@trvlcorp.com. in Argentina for planning your hunting adventure. Also ensure that your paper work or documents are verified to avoid being inconvenienced by authorities. All in all dove hunting is a fine and worth experience for anyone who enjoys outdoor fun and adventure. It’s easy to plan as well as safe. There additional activities visitors can do to add to hunting. There are professionals to ensure great value for money. When it comes to hunting, there is no feel that can be compared to that of a natural habitant with a large array of species to choose from. Scotland hunting fits the correct definition of perfect hunting destination in the world as the whole hunting is transformed to more than just a sport to a great hunting experience that will be remembered for a long time to come. Scotland is in the list of the few countries where you can simply enjoy the delight of hunting to full potential. This is largely due to the fact even though the species that can be hunted are controlled; they are in fact in large numbers hence a hunter’s small paradise. These species include the pheasant, partridge, hare, grouse, pigeon and ptarmigan. For those who want a little more adrenaline running through their system, the opportunity to hunt bigger game animals is availed. Species availed for hunting include the Red, fallow, Sika deer, roe that takes deer stalking to a whole new level. Ideally Scotland offers one of the very best in hunting experience s as it is steeped in colorful history and tradition of hunting that is revered. The special atmosphere offered by Scotland allows hunting to be done both in low lands or steeped and hilled areas. Ideally selective culling of animals is done in various ways, this includes use of traps on known routes and stalking that offers one the opportunity to face off with the prey. The feel of an animal charging away from you when you have a one chance shot is like no other. This however is nothing compared to the adrenaline rush one feels as the prey charges towards you in order to fight for its survival. Various hunting opportunities offered include that of a guided hunt for less experiences hunters. Seasonal hunters get to go to solo group hunts with friends; with the offer standing either per day or per week according to one’s own budget. To make the hunting experience in Scotland even more so challenging, night hunts are offered to make it difficult and one has to rely on groupings and pure instinct in order to succeed. However, a sure way to succeed in the hunts however is to simply go hunting during the October rut season where the animals are more concentrated on mating and thus are not as cautious in their everyday affairs. In all Scotland is proving the ideal hunters paradise for all the adventurous and hunting experience. Getting bored while here, regardless of the sporting association chosen is never an option as you will be busy clicking away and stalking, preying, crawling and hunting to your hearts satisfaction. 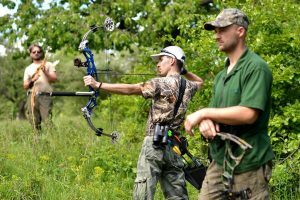 The Bear Archery Cruzer Bow – What Younger Bow Hunters Need! What is a Good Hunting Bow? What is the legal draw weight for bow hunting? Some recommended products may use affiliate links. TheHuntingSite.com is a participant in the Amazon Services LLC Associates Program, an affiliate advertising program designed to provide a means for sites to earn advertising fees by advertising and linking to Amazon.com. Amazon and the Amazon logo are trademarks of Amazon.com, Inc or its affiliates.